We are getting reports of more and more flat panel television thefts from hotels. Here is some theft prevention suggestions that I have found that are working for various hotels. The majority of flat screen thefts are from in-hotel gyms and workout rooms. The gyms have larger screen TVs than the guestrooms, and they are often unoccupied. It appears that these thefts are probably “inside jobs” by current or former hotel employees, or by outsiders that have colluded with current employees. Employees know the staffing levels, how to sneak in and out of the hotel, and what the security cameras cover. So don’t overlook employees when you investigate these thefts. Other TV thefts are stolen from common areas of the hotel, such as function rooms, breakfast rooms, etc. There are thefts of TVs from guestrooms, but they are minimal at the time of this writing. Inventory ALL of your flat screen televisions and write down their serial numbers. Prepare a spreadsheet of all the televisionsâ€™ serial number, make, screen size and exact location inside the hotel. If the TV is stolen, you will have the exact serial number of that television to report to the Police. Report all thefts to the Police, including the serial number. Take the time to report the theft. Once it is “officially” reported as stolen, it now becomes a felony crime to sell the TV or to be in possession of it. These TVs show up in police raids, pawn shops, and even at other hotels. Courts and District Attorneys often do not file charges against someone found with a TV, if it was never reported stolen in the first place. Protect your right to prosecute the thief, who may turn out to be an employee. Write or paint your hotel name on the back of each TV. Thieves hate this, as they have to clean it off before they can sell them, and it often looks like they altered or removed something from the TV; so people buying the TV get nervous about the purchase. You can buy felt tip pens that contain and write in paint, not regular ink. 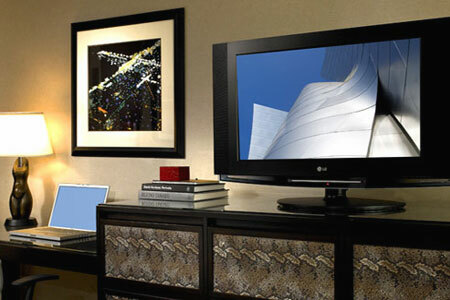 It is an easy way to inscribe your hotelâ€™s name on each television. Guests won’t see the writing on the back of the television. This also leads Police back to your hotel if someone is stopped and has the TV in their back seat. Install an anti-theft alarm to each high risk flat panel televisions. These alarm boxes are typically glued with epoxy onto the back of the TVs. If someone removes the TV, a loud audible alarm is triggered and can run for hours on a small battery. The alarm can be deactivated by Management using a special key when there is a need to move or service the television. Many hotels have used this device and have had good luck with it. It is a reasonably priced anti-theft device for your high risk flat panel TVs. Â One such anti-theft alarm that many hotels use is Sonic Shock. It can be used to safeguard televisions, computers, laptops, LCD projectors, and other high-value theft prone equipment. Audible alarms are widely by colleges, universities, and businesses worldwide who wish to keep high-value electronic assts in the open and accessible without the worry of them â€œwalking offâ€. Designed to emit an ear-piercing audible noise if the equipment is moved, the devices rob thieves of stealth and anonymity. They either have to spend time trying to deal with the alarm, take the alarm with them, or leave empty handed. It is sort of like the red-dye packets that bank insert into the bags of money they are forced to hand over to bank robbers, making it pretty easy to ascertain when a theft occurs. As always, please evaluate the product for yourself, as The Rooms ChronicleÂ® and Petra does not guarantee this product, its use or reliability. Neither TRC nor Petra makes money from the sales or recommendation of this product. I have 2 hotels and we recently installed new Flat Screens into every room. After about a month, we had three stolen and I was concerned about the remaining 187. I came across this product (http://www.lockmytv.com) which secures the TV using the existing VESA Mounting Holes. It does not require i glue anything to the TV and all of the locks can be keyed to the same key code. I really like and so do my managers. Hi I have small motel with is and i jus remodeled all the rooms and i would like to know if anyone know of a a antitheft system that i can put that will prevent theft of all the item in each room, pictures, tv, towels. etz. enjoyed reading it, you can be a great author.I will make sure to bookmark your blog and will eventually come back someday. Thank you so much for your comment! We hope to continue to keep the blog and everyone updated with the latest information from the hospitality industry. The best way to monitor not only the Flat Panel TV thefts and meeting room overhead projectors but also monitor hot water heater water temperature and locked storage doors and even vacant guestroom doors is with the use of TV alarm System. I found mine at Biax Communications.